When the Winds Blow, Which Way Do You Lean? 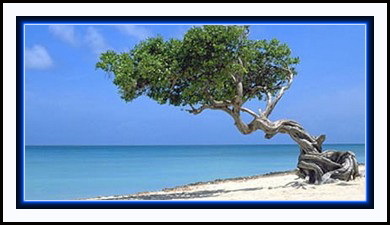 Have you ever seen a Divi Divi tree? That’s one in the photo. It is almost a national symbol on the Caribbean islands of Aruba, Bonaire, and Curacao. As an evergreen, the Divi Divi trees have inconspicuous but fragrant blossoms. The trees’ pods, wood, and leaves have several uses. Though slow growing, they are capable of growing to 50 feet tall but will almost always be bent at a 45 degree angle due to the constant-blowing trade winds. Because of this, the trees bend and point to the west, as the winds blow from the east. In Aruba, lost tourists are told to use the trees as a compass. Some say the Divi Divis are bent over because of leaning into the wind; others say they are bent over because of leaning away from the wind. Either way, the trees have adapted to the winds and grow in spite of them. Their twisted Medusa-like trunks and roots will grow in rich clay soil as well as the sand. I love these trees! I love how God speaks to us through nature. Maybe we should consider growing like the Divi Divis. When the winds of adversity blow, do we bend because of the blasting currents, or do we lean along with the challenges? If we lean with the trials, we will never be blown over as long as we are rooted solidly in the Lord. We will still have our fragrant blossoms and always point the way to our Savior, being a compass for others to find their way. Though we will have the winds of temptation, loss, distress, or others beating against us, we can adapt, persevere, and survive, no matter what the situation.